The far west of Singapore is a wasteland of industry, a wedge of long, straight roads that lead to nowhere in particular and have long run out of names, bearing instead digits and mind-numbing epithets: crescents, circles, loops, links, views, places, walks, circuits, sectors and squares in a flat and flattened corner of the island that shunned the city for as long as it could until the town beat a way to its shores and made an offer it could not refuse – a chance to be reborn, remade, reshaped, reclaimed as the engine of a nation and a cog in the transformation of a country from fortress to factory. The far west of Singapore is a land forgotten by history, a long, ragged line of inlets and capes, rivers and estuaries, mangroves and mudflats, freshwater swamps and fringing reefs that fed and fuelled the residents of coastal settlements who looked away from the city and towards the straits, whose names were lost, reclaimed, buried, expunged as the town turned Jurong into a corporation and Tuas into a broad belt of wharves, yards and terminals. The headlands of Tanjong Gul, Tanjong Rawa, Tanjong Karang and Tanjong Merawang now rise only in expired maps, while Chichir, Kuching, Bajau, Blukang and Merawang have faded from charts and now float under tar and tanks, tracks and threads – isles with no names, no memory and no place in a country that refuses to be constrained by its past and its borders. The only remnant of Tuas to survive untamed lies between a biochemical plant and a marina, and is marked by a starboard beacon erected on a rocky mound at the tip of a tongue of sand, mud and seagrass that runs northwards along a sea wall, fords the mouth of a storm canal and swells again to host a copse of mangroves, Avicennia and Sonneratia, around which fiddler crabs scour the silt for meals that arrive twice a day or not at all when the luminaries find themselves at odds with each other and temper the tide with their tiffs. Considerable stretches of this shore are littered with rubble, dead shells and skeletons that hint of richer depths or recall a time when the edge of this sea felt the lay of the land and the waters rose to soak, flood, probe, stroke, brush against the folds of hills, farms and forests, only to sink back again when the elements found no clear points of departure, no telling where one ends and the other begins, no lines to be drawn, no love between the lines. Slippery filaments of blue-green algae cloak portions of the beach like a thin layer of greased hair with limp, unruly partings. The cyanobacteria appear to wax as the flat nears a break in the wall, the final destination of municipal discharges that emerge from a culvert by Tuas West Road and trace a straight, northwestward route to Merawang before a trickle and a sigh, as the waterway meets a grill with two tiers and sheds its burdens into a sallow trough. The lower edges of the canal, along with its floor and a row of bulkheads that guard its gap, are infested with tropical oysters that spare no hard surface below the high water mark and, like the microbial tufts that cling to softer rims, seem to revel in the sweet-savoury soup of rain, runoff and tidal incursions that steeps in this swale of fertile suspensions. 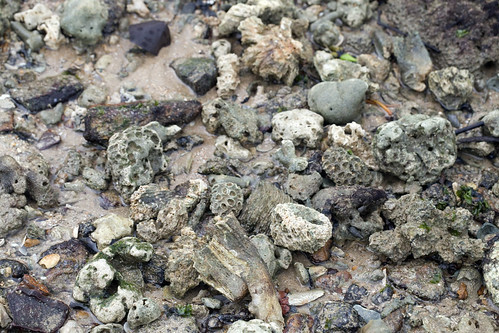 The higher reaches of Merawang are by and large a slope of raw particles, boulders and ridges, miniature ramparts and worn formations, surrounded by the remains of corals, clams and scallops, broken by porous fingers, soft green blades and carpet anemones – cracks, creases and cavities in chunks of loose rubble overrun by porcelain crabs and other filter feeders that prefer the dark side of every mound and slip away helter skelter when their world is overturned and tumbled out. 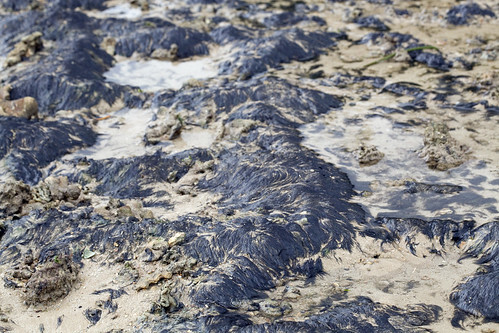 The falling tide also reveals a terrace of pools fringed by algae and Halophila, and holding just enough water to cover the spires of shallow coils. An olive whelk ploughs through a bare patch, its long snout raised and tilted at possible sources of nourishment. Gangs of gold-spotted mudskippers play tag on the surf or cling to perches where the foam dashes against their flanks and washes the silt off their backs. The epibenthos is otherwise dominated by zoanthids, their crowns tucked in columns that perforate the shore with a minefield of squat, shrunken blobs, buttons to a magical mystery tour just a step away from a sinking feeling. 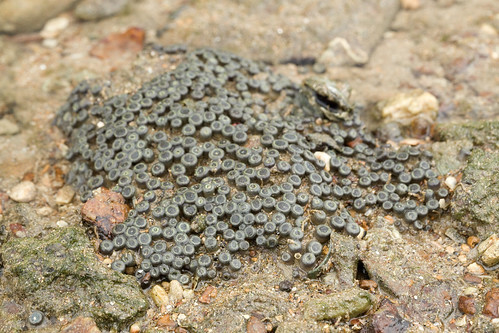 A small xanthid on a bed of pebbles gave in to the urge to budge, betraying itself and its neighbours: gobies that stuck their heads into hollows and an even tinier hermit that kept calm but refused to carry on. 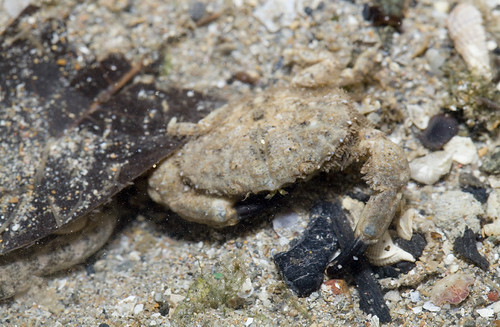 The crablet, identified as Leptodius sanguineus, bore somewhat spatulate fingers, miniature versions of the chelae welded by other, much larger beasts that lumber over reefs in the straits to the south. 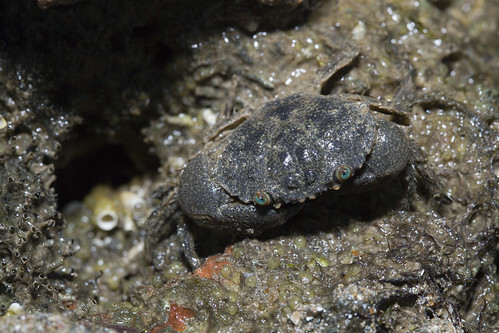 Though not uncommon at intertidal depths and having a range that spans the Red Sea and Hawaii, this crab is still rather poorly known, the possible artefact of an inconspicuous profile and cryptic habits; the animals tend to lurk in pieces of coral or bury themselves in the sediment. Reported to prey on small shellfish, the xanthids are themselves consumed by swimming crabs that encounter them in exposed positions and manage to crush their defences with brute, brachyuran force. Stone crabs are far more visible bruisers, being probably more than a match for most portunids. Young individuals occupy the chambers of coarse rocks, while full-sized specimens peep from incomplete shadows and tight corners, which they grip with bulldog force and belligerent glares. Come dusk, the menippids emerge from their dens to taste the ground for stray snails and bivalves, whose shells they crack with a blunt, broad tooth on their major claw. Deliberate in nature and thoroughly indifferent to the rhythms that hold us captive to the hours, to the clock that fails to talk and to our singular fear of a temporality with no ends in sight, the crabs are unlikely to make a dent in the molluscan population, which still seethes with recruits from recent emissions into the thick, brown broth of a shuttered sea. This corner of the straits, the far west of an island in love with larger dreams, still strains against its walls, against the lines that seek to carve and conquer its waters, to turn the tip of the peninsula into a dry and promised land. 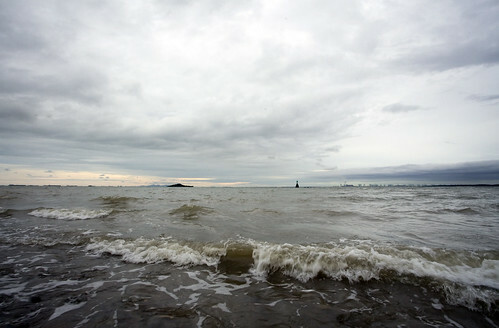 But the sea may never rise again, save with a slow, warm wrath, for the time for trysts is over, and the city has turned its back, shut its eyes, buried its heart – this straits has shrunk and gulf has widened between two worlds too removed from each other, too close for comfort, too long apart. Really enjoyed reading this. Appreciate the blogs capturing what's left untamed around our industrial isle. Whilst the city hums in the name of growth, we grasp at what we can, before what wildlife we have ebbs away like an outgoing tide, in the face of an unseeing populace.